Diogenes Ballester arrived in New York City in 1981. During the first two years in New York, he was exposed to museums, artists’ studios, workshops, and the major art trends of that time. He produced a body of work about his initial immigrant experiences and collaborated with community grass-root art groups such as El Taller Boricua, The Moriviví Art Gallery and El Museo del Barrio. He worked collectively with artists from throughout the world in the prestigious printmaking workshop of Robert Blackburn intermittently from 1981 to 2003 when Mr. Blackburn died. As a master-printmaker, he is skilled in line engraving, etching, and woodcuts. Ballester left New York City from 1983-1986 to pursue an MFA at the University of Wisconsin in Madison, where besides his study of art he studied and collaborated with scholars in the fields of sociology and cultural history. This interdisciplinary work convinced him that “owning one’s history” is part of gaining ownership of one’s future, and manifests in his art thereafter. In addition, Wisconsin afforded Ballester the opportunity to study computer-generated art, work with an international community of Latin American and Caribbean scholars, and travel to Europe for the first time in 1985. Ballester moved back to New York in 1987 and became involved with artistic, cultural, academic, and research activities. He also maintained his studio in Puerto Rico until it was destroyed in 1999. This was a period of progressive development in the language and style of his art and his role in the community. Accomplishments include: 1) Solo exhibition “Salute to the San Juan Biennial”, 1986; 2) Participation “CRASH: Computer- Assisted Hardcopy”, Wright Museums of Art at Beloit College, 1988; 3) Artists-in-Residence Grant, The New York State Council on the Arts, 1988; 4) Curator "Reflecting on the Twenty Years of the Puerto Rican Workshop: Taller Alma Boricua, 1969-1989” for El Museo del Barrio, New York City, 1989; 5) Participation “ The South of the World: The Other Contemporary Art” at The Contemporary Museum of Art in Marsala, Italy, 1991; 6) Artist’s Fellowship, New York Foundation for the Arts, New York, New York, 1991; 7) Solo exhibition “Spiritual Celebration”, The Museum of the Americas, Old San Juan, Puerto Rico, 1993. During this time, Ballester began to put into visual and written practice the “owning history” ideas that had been fermented in Wisconsin. He began to produce work generated from his Puerto Rican Espiritist experiences as part of an ongoing exploration of globalization and the interaction between cultures in metropolises such as New York City. This work was enhanced by living and working in Paris for two years, 1999-2000. He witnessed the process of globalization in the interchanges between French nationals and immigrants from the ex-colonies, was exposed to the transnational world, and solidified developing ideas of global interchanges between cultures, which began to manifest in artistic expressions of syncretic altar installations. The death of his father in 1999 and opportunities to exhibit in Haiti and Cuba deepened and enhanced this perspective, as did a trip to Taiwan in 2001 and to Guanlan, China in 2009. Written critical analysis began with the documentation the Puerto Rican visual art movement in New York when he worked at El Museo del Barrio organizing, cleaning and cataloging the permanent collection. As president of the jury of the San Juan Biennial, he again took up the challenge of critical analysis, writing an essay for the catalog on the history of the Biennial and printmaking: “Perspective: On the XII San Juan Biennial of Latin American and Caribbean Printmaking at the Transition to the 21st Century”. This essay influenced the future direction of the Biennial and enhanced cooperation between U.S. and island born Puerto Rican artists. In “Aesthetic Development of Puerto Rican Visual Arts in New York as Part of the Diaspora: The Epitaph of the Barrio” written for and presented at The International Art Critic Association in 2000, Ballester focused the historical analysis on the Puerto Rican movement in New York. This paper influenced several master and doctoral level art historian students to focus their research in this area, an endeavor he has supported by opening his personal archives for their use. 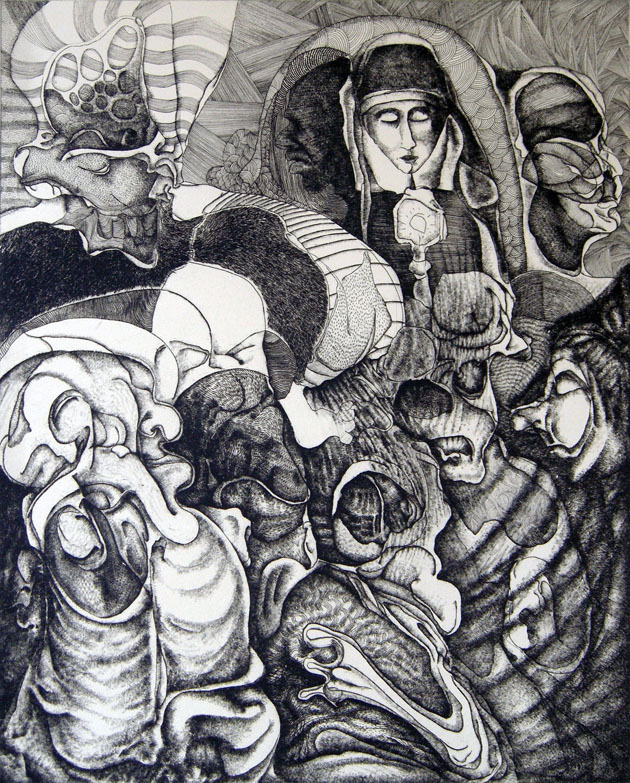 During Ballester’s residency in Paris, he collaborated with art historian and poet Francisco Sorribes Vaca on a book entitled “Encuentro con la Madama: Mitologia y Realidad en la Obra de Diógenes Ballester, 2003, Paris, France. Based on a dialogue between the author and the artist, the book documents stories that inspired Ballester’s art-works. Other accomplishments during the Paris residency included Globalization, Post-industrialism and Syncretism, 1999 at the Multicultural Forum of Contemporary Art at the Port-au-Prince National Museum of Haiti, 1999 and at La Casa de Las Americas in Havana, Cuba for Symposium Myth in the Caribbean, 2000; an installation Earth Energy, Space Confluence, Paris, France, 2000; and participation, 1001 Reasons to Love the Earth, World Art Collection and Foundation 2000, Amsterdam, Netherlands. Building on the theme of tansnationalism as a function of immigration, Ballester curated an exhibition and wrote an introduction essay “Intersecting Circles” presented in Krakow, Poland in 2004, which highlighted the art of six Puerto Rican, Dominican, and Uruguayan artists. He then coauthored with, Dr. M. Boncher a piece on the syncretic aspects of Puerto Rican Espiritism in his work, which they presented in 2006 at the Latin American Scholars Association Conference. In November 2008, he presented a paper Graphic Language in The Development of Individual and Collective Latino Identity at the “U.S. Latino Printmaking in the 21st Century, Conference in Austin, Texas. Teaching art formally as a visiting and an adjunct professor in colleges and universities settings and through a variety of community venues is the third aspect of Ballester’s endeavors to “own history”. His teaching is about the creation of art as a means of self-expression, creativity, discipline, and learning about multiple perspectives in the telling of one’s story. Of particular significance, has been the art and healing curriculum he developed after being confronted with health issues from the impact of toxic materials used in the arts. His community teaching with high risk children, HIV infected adults, and senior citizens has included: the YES Program, Taller Boricua: the Lower East Side Arts Program; NYSCA teaching fellow; Musica Against Drugs and Casa de la Herencia Art Project. He also had the opportunity to work with adolescents as the director of the CAP Program through Cooper Union at ABC No Rio and Jamaica Center for the Arts. Collectively his “owning history” endeavors through the visual and written media and through teaching have renewed Ballester’s spiritual life, influencing his artistic production. Over the past eleven years, Ballester increasingly focused his artwork on visual depictions and exploration of oral history, memory, mythology, ritual, and cultural identity along a transnational spectrum. In recent exhibitions, he has appropriated cultural objects and historical artifacts together with painting, drawing, prints and new media as a way of accessing the past and re-interpreting the present in a trans-Caribbean dialogue. Archeology of Memory: They Are Talking, 2010 presented at the National Art Gallery in Santo Domingo, Dominican Republic is an example of Ballester’s most recent artistic exploration. This installation consists of a eight 9 by 14 foot, encaustic painting panels and a 14 by 10 foot floor installation of coconuts, and charcoal. The installation addresses the African contribution to Caribbean identity and culture and pays homage in particular to the people of Haiti, who struggle to recover from the devastation of their recent earthquake. Damballa (a Loas god of Haiti) who carries within his archival brain the memory of Africa, Elegua (the Yoruba god of the journey who saw the African slaves safely to the Americas), Congo sculpture like figures, and cowry shells, once used as currency in Africa, are placed within the painting on planes of rich earth toned colors. A circle formed by a stripped serpent emanates from Damballa, ties the elements together, and is indicative of a blessing of the earth performed in most indigenous religious ceremonies. As in other site-specific installation pieces, Ballester expropriates elements from the culture as part of the offering. In this case, coconuts, commonly sold on the streets of Santo Domingo by bicycle venders, form a half circle in front of the painting. The interior space of the half circle is filled with charcoal – fuel obtained through the de-forestation that has so damaged Haitian and other third world ecologies. Coconuts also sit on top of a geometric formed pedestal altar. The installation invites the viewer to observe or pray, depending on their inclination. Point of Origin, 2010 was created on invitation from the Museo of Art of Ponce, Puerto Rico to respond to the Museo’s collection of African sculptures and masks. This installation offered the opportunity to celebrate the collection and to reflect upon the fundamental and syncretized role of Africa in Puerto Rican culture, termed the first house by José Gonzales. The mask and sculpture depicted in Point of Origin speak of stories about assistants who protect and guide, transmitted through the African Diaspora and told to Ballester by his family. Point of Origin, like the fertility mask of the Ebo (Igbo) People of southeastern Nigeria, honors fertility, sensuality, and beauty. The ritual manifested in the mask and repeated in Ballester’s painting starts and ends with the circle, the perimeter of which is defined by pregnant women facing outward as they dance around a figure. Ballester interprets as Ochun, the goddess of love, intimacy, and beauty from the Yoruba religion of western Nigeria. The movement and intentionality of the dancing figures are celebrative and protective. Ochun raises from the center a commanding presence. The bird, which Ballester depicts as the red phoenix an ancient mid-eastern and Chinese symbol of resurrection, crowns the head of Ochun and projects the force of fire and the ability to transcend. The sculpture of the small African man, symbol of potency, also finds a place in the painting, as the male contribution to ongoing life and ancestral connection. Ballester places his rendition of the fertility mask and male sculpture in the deep blue sea, across which the Diaspora occurred and reminiscent of Yemaya, Ochum’s mother and the goddess and protector of the waters, who guided the about assistants who protect and guide us ancestors safely to Puerto Rico. The installation of the Point of Origin with the Museo’s collection of African masks and sculptures forming a circle repeats and reinforces the theme of connectedness. The multilinguistic installation entitled The Crying of the Earth, 2010 shown at the 1st International Triennial of the Caribbean organized by the Modern Art Museum in Santo Domingo, Dominican Republic is another example of Ballester’s installation work that is imbued with oral history. In this piece, Ballester integrates a large scale encaustic painting, topped with signage depicting the Spanish translation of a stanza of the poem “The Crying of the Earth” written by poet mb. This installation continues on the floor in a semi circle shape. On the floor space contiguous with the center of the painting is an assemblage symbolizing a trap made of wood and metal surrounded by cowry shells and raw charcoal from the border of Haiti and Dominican Republic. A series of wood cut out shapes of a trans Afro-Caribbean character riding a bicycle emerge from the charcoal to confront the global warming crisis. Spirit of Slaves, 2007-2008 presented at the Museum of Art of Puerto Rico in the exhibition titled Free Registry: Encounter: Mythology and Reality, 2008, is another installation altar piece created with the intention of “owning history”. The center piece of the installation is a large encaustic painting, depicting Ballester’s visual reaction to the “Registry of Slaves from the Village of Ponce, 1852”, which he discovered at the Ponce Historical Archives. Wood relief sculptures of Afro-Caribbean figures stand like centurions in front of the painting A flat screen mounted on the wall displays a website of the pages from the Registry of Slaves. Another a flat screen called the Free Registry is embedded in the painting. It displays a blog website Diogenes-Ballester.com with written thoughts, reactions, and/or interpretations to the Registry of Slaves by the audience (both those who attended the exhibition and online website contributors). A glass/metal podium-like artist construction provides a place for the museum audience-response computer, keyboard, and mouse who are invited to respond to the Registry, inscribe their names as part of that history and offer their own descriptions and thoughts. Spirit of Slaves, 2008 encompasses and transcends the notion of slavery entailed in the physical descriptions of the slaves in the Registry. While the Registry clearly asserts the objectification and subjugation of a people, the very existence of the Registry also affirms the African presence and contribution to the culture of Puerto Rico. The Free Registry embedded in a painting about an ancient African civilization re-frames the lost history of the Ponce slaves within the broader context of the African Diaspora. In the audience responses, the first person voices of the slaves are re-asserted through their descendants. These first person descriptions offer a re-conceptualization of not only the past but also the present. This is particularly important in a society that has integrated the cultural and spiritual contributions of Africa, while denying the existence of the bloodline. Ancestral Confessions: Historical Evidence of a City, shown at the Museum of the History of Ponce in Puerto Rico, 2006 included a number of installations that were based on the oral history that Ballester experienced in the south of Puerto Rico. For example, he encaustic painting entitled “María del Mar”, 1993 depicts la Madama, Yemaya, the Virgin Mary coming out of the Caribbean Sea and facing La Playa de Ponce. Symbolic of the Espiritist sea rituals “María del Mar” also speaks of the role of the sea in bringing African and Afro-Caribbean beliefs and culture to La Playa de Ponce. For the 2006 Museum of the History of Ponce installation, Ballester borrowed from the Museum’s collection four wooden hand carved statues of Santos dated from the 19th century. The Santos are significant. The Virgen de la Monserrrate is one of the few black virgins in Catholicism. Saint Martin de Porres a dark-skinned, half Indio was initially taunted by the other Dominican monks for being a mulatto. But his holiness and spirituality could not be denied. He was canonized a saint for his work in Lima Peru. Elegguá, one of the great Yoruba Orishas who occupies a privileged position in the Spiritualist religious tradition as “keeper of the way,” “master of the future,” and “granter of happiness” is syncretous with St. Martin de Porres. Santa Barbara, an early Christian martyr, is associated with lightning. Santa Barbara became the disguise for the Yoruba deity, Chango, god of thunder and lightning. The fourth statue was of a small angel. Ballester placed the Santos in four mounted glass display boxes on the wall adjoining that of “Maria del Mar”. He gathered sand and shells from la playa - reminiscent of the sea rituals. Three vases filled with sand with the shells on top in the form of a cross were placed on the floor pedestal creating the base of the installation. The Sol Trunco, fan shaped lattice ventilator creates a half moon as well as a sense of openness to the Catholic European and African identity and religious believes evidenced in the South of Puerto Rico. “Keeper of History – Holder of Dreams” exhibited at the National Museum of Catholic Art and History in New York City2006, and first shown at El Centro for Puerto Rican Studies Gallery, Hunter College New York City 2004 explores issues about oral history and memory associated with transplanted cultures. Drawing on the concept of "La Madama" that is rooted in religious beliefs brought from Africa by slaves, and preserved in the oral traditions and spiritual practices of syncretized religions that emerged in the new world, Ballester documents the aesthetic conception of syncretism. For this installation, Ballester used charcoal drawing on carved wood panels, found objects, web site transmissions, and an artist's book, which includes an epic poem of the same title by mboncher. In another graphic oriented experimental work, the artist book “Keeper of History–Holder of Dreams” consisting of collaged images of the matriarchal Espiritismo steeped Ballester family in La Playa de Ponce, Puerto Rico was transmitted via a web stream from Ballester’s studio to Medianoche Gallery where it was projected on the wall next to an installation of a large hand-made blank page artist book. This work questions the sacred role of the book in preserving knowledge and conveying information in the digital age. Finally, the installation Globalization, Post-industrialism and Syncretism, 1999 shown at National Art Museum of Port au Prince in Port au Prince, is a sixteen-panel work composed of two encaustic and charcoal pictorial images executed in Paris. One section features the image of Ballester’s father recently deceased. Achingly drawn from memory and filled with emotion, this section pays tribute to the senior Ballester, his Taíno ancestry, and the ancestral home - La Playa de Ponce. The second section features a nocturnal image of an African woman, or Madama, based on a vision during Ballester’s days of mourning. Carrying a broom whose bristles take the shape of the city of Paris, the woman engages the viewer with the greeting, Bon Soir. She carries a basket decorated with a rosary and cross and filled with fruit and vegetables – simultaneously the image of the divine grace of consolation visited upon the bereaved and a testimony to the African and Catholic ancestry and Afro-Catholic spiritualism of Ballester’s family. A piece of Haitian rope connects the art piece to a basket of charcoal both an offering of transformative energy and a symbol of the de-forestation of the country of Haiti.